The Buddha was born as a prince, the only son of King Suddhodhana and Queen Maha Maya of the virtuous and noble Shakya clan around 560 BC. The place of his birth, Lumbini is now situated within the territories of Nepal. He was born under a blossoming and fragrant Sal flower tree. The Buddha Found Out the End of Suffering and called it "Nibbana". The word "Nibbana" was coined by Him. Around 623 BC, in India, the people in general were inclined towards spiritual pursuit. It was customary, for a young man to get married when he was about 16 years old to a damsel of 14 years. The young couple lived with their parents and other family members in one household where every adult contributed towards the upbringing of their children. When the “ripe old age” of 32 was reached in their lives they would become Brahmachari and lead a celibate life in pursuit of spiritual happiness devoted to meditation. This was a traditional practice found in India even in the 20th century as Mahatma Gandhi’s life shows. He,.. Mahatma and his wife Kasturba took up the Brahmachari precept, when they were 32 years old, after bringing up 16 children. During this period in History, the social order was such in India, that there were 4 castes. The Kshatriyas, Brahmanas, Vaishyas and Kshudras. Kshatriya were the royals, who governed and held the highest position in society. The Brahmanas were the Brahmins who taught the people what is good and bad, the sages who gave good advise (and sometimes bad as well..!) to the Royals and all other people in the society, and as such held a high positions as teachers of religion and righteousness.Vaishyas were the business class, extremely rich, and engaged themselves in commerce, trading between many lands, bringing in wealth to the country. The Kshudra were the lowest of castes and were generally, the labourers and such, who were looked down upon in society and all sorts of menial and lowly jobs were thrown upon them. 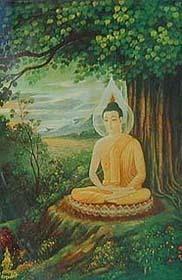 Prince Siddhattha, "The Buddha to be" was born in such an environment. It is said that the Bodhisathwa, was in the Thusitha heavens marking his time until it was ripe for him to make his appearance on earth. The Bodhiwathwa considered five aspects to see whether the time is ripe for him to be born into this world. The Bodhisathwa saw that the time was right as the people in general were seeking the truth, the Noble family clan the Shakyans were already on earth serving the people in their wholesome ways, the Mother, Queen Maya was already born on earth (descendant of the Brahma worlds to the our world) ready to give birth to the future enlightened being, and the “Magadha Desha” was a suitable territory where many a Brahmin was already teaching meditation and were seeking the truth about life and happiness, and the chosen country where each one of these fitted in was India, as we now know as a historical fact. Bodhisathwa – the person who would later become the all enlightened person the Buddha. When the Bodhisathwa realized that it is now the correct moment in time to appear on earth he descended from Thusitha heaven and conceived in the womb of Queen Maha Maya, when she was sleeping. 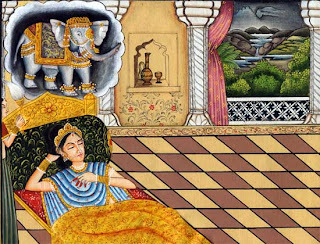 During this time she dreamt a white elephant carrying a lotus flower in its trunk circling round her three times and entering her womb from her right side thus portraying a pure birth. The year was 623 B.C. Close to the foothills of the Himalayas, in the northern parts of India and in what is now Nepal, there lived the noble tribe of Shakyans. The capital of this territory was Kapilavastu-pura (Kapitavastu-city). Their ruler was King Suddhodhana. His wife was a Koliyan princess, the daughter of King Anjana of the Koliya country (Nepal). She was of remarkable beauty that she was named Maya, which means “vision”. Not only was she beautiful, but was renowned for her virtue and intelligence. King Suddhodhana too was a very just ruler and popular among his subjects. He was highly admired, honoured and respected by all. When the date of birth for her baby came closer, the Queen wanted to visit her parents, as it was customary for a young mother to have her new born baby at her father’s house. Therefore, the King arranged for her to visit her parents. In the procession his soldiers went first, to pave the way for the Queen and her retinue, to follow comfortably and safely. Along the way they were to pass the park called Lumbini, which was a most beautiful park full of fragrant “Sal” trees. The Queen felt like taking a short rest there as it was so beautiful with birds and fragrant “Sal” flowers and it would be a delightful place for her and her retinue to repose for a while before proceeding. As she relaxed under a “Sal” tree holding a branch laden with Sal flowers, the birth of her baby began and her son was born. It was an auspicious day. It was the full moon day of May, which is now known as “VESAK”. 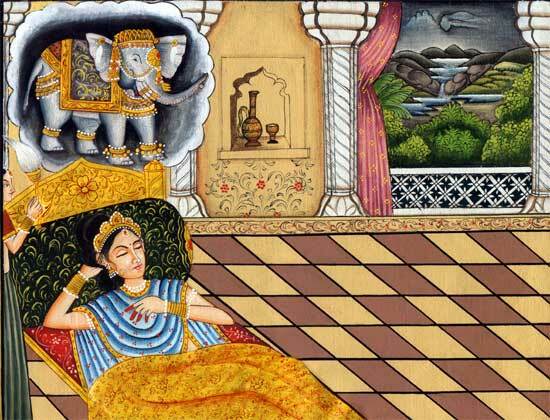 After the birth of her son, the Queen returned to Kapilavastu abandoning her plans to visit her parents. When the King heard this he was delighted and the people of the state hearing a new heir to the throne was born, rejoiced holding many celebrations round the countryside.